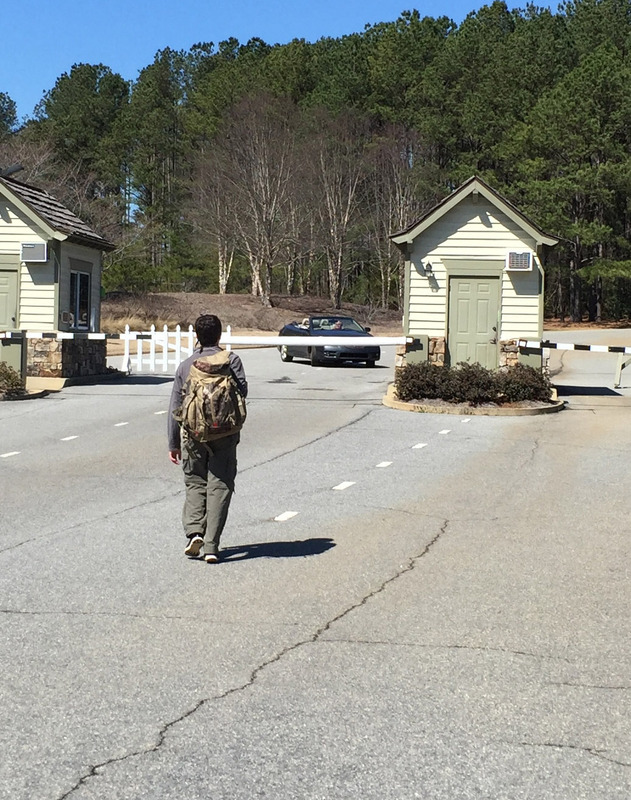 The troop traveled to Pine Mountain, Georgia for a weekend of fun at Callaway Gardens and the Franklin Delano Roosevelt State Park. We enjoyed the adventure course, Birds of Prey show, and geocaching at Callaway. Traveling to Pine Mountain on Friday evening, we arrived at the pioneer campsite after dark. The patrols worked to set up their tents and a combined cooking area. The adults and the Leadership Corps appropriated the adirondack shelter as a kitchen area. After setting up the campsite, everyone began cooking dinner. The patrols combined to make some tasty tacos and the Leadership Corps/adult leaders cooked up a soup of chicken and gnocchi pasta. The evening passed quietly in comparison to what was to come on Saturday evening. A few of the scouts, geared up and ready to take on the course. On Saturday morning we arose early in order to cook, clean up, and be at Callaway Gardens by 8:30. We checked in at the Discovery Center for the Treetop Adventure Course. The course involved a number of challenges that crossed between platforms in the trees next to the Discovery Center. As we moved across the platforms, about fifteen to twenty feet in the air, we were confronted with swinging bridges, cable traverses, zip lines, and other nefarious obstacles. The course tested the scouts' confidence, strength, agility, and concentration. Several of the scouts were unsure about their ability to successfully complete the entire course. However, everyone gave it a good shot and most finished the route with a strong effort. Nicky negotiates the two cable traverse while Hunter makes his way across the swings. Following our time in the trees, our Lead Troop Guide unfortunately left us to fulfill his obligations as the first chair trombone in the AJHS band. He was transported out to the front gate where his father picked him up on the other side of the entrance. The whole thing had a very Bridge of Spies vibe to it. Louie is exchanged across Checkpoint Charlie. Back at the Discovery Center, everyone else pulled out the lunch fixin's and made sandwiches at the picnic tables next to the course. While we ate, other participants on the course whizzed by on zip lines overhead. After lunch, we headed out for a hike across the gardens in search of geocaches. For those who are not familiar with geocaching, it can best be described as a high tech scavenger hunt. People hide small containers called caches in all sorts of interesting places and post the GPS coordinates online at websites such as geocaching.com. This allows others to hunt for the caches using a GPS receiver or an app on a smartphone. All of the caches at Callaway Gardens are placed with the permission of the educational department at the gardens. 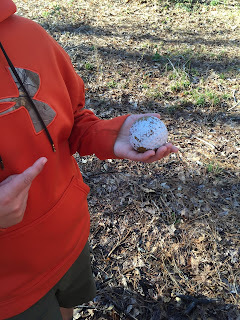 The first cache we found was hidden right next to the adventure course we had just completed. We then headed out in search of more and found three in quick succession before we came up empty on the fourth cache. At that point we decided to take a break and headed back to the Discovery Center in time for the Birds of Prey show. A red-tailed hawk comes in for a landing. The show involved four birds; a horned owl, two hawks, and a vulture. The birds flew back and forth over the heads of the audience at the command of the trainers. Several scouts felt the rush of air as the birds swooped low over our seats. The show was a good opportunity to see and learn about these interesting birds. Afterward, we were back out on the trail looking for more geocaches. One of the caches took us inside the Day Butterfly Center in search of a set of numbers. The numbers were then used to open the lock on a cache in the gift shop. The most interesting cache of the day was found next to the golf course. The container was shaped like a large golf ball. Creighton holds the golf ball cache. Back at the campsite, the scouts began preparations for dinner. As they began cooking meatballs to accompany their spaghetti, there was a slight mishap involving the stove that caused a few moments of excitement. Fortunately, the incident was quickly contained and a few lessons were learned. 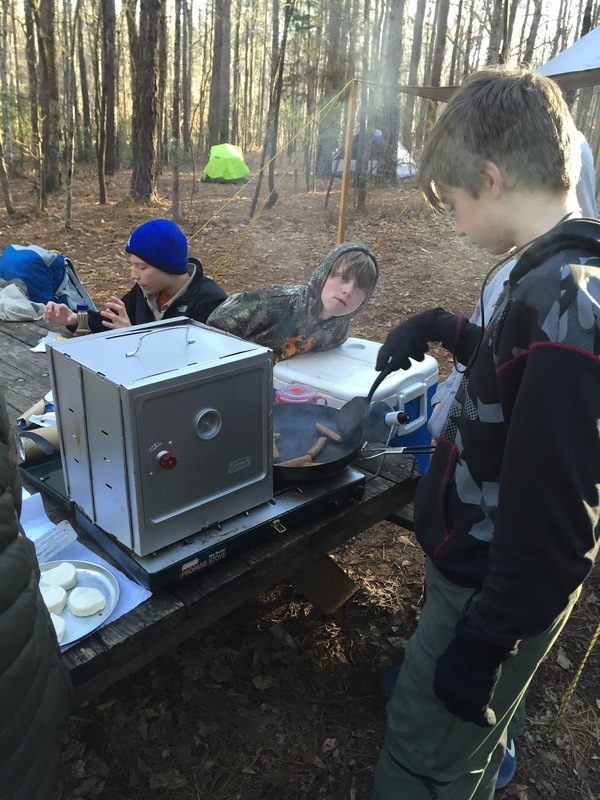 The scouts learned where to find the fire extinguisher in their chuckbox and they learned that the propane cylinder must be tightly connected to their stove. Dinner seemed almost anti-climactic after that point. The scouts work on dinner as the afternoon fades into evening. Ethan cooks breakfast on Sunday morning without incident. On Sunday morning, following a filling breakfast, we broke camp and packed up the trailer. Aiden, our Chaplain's Aide, and Mr. Lytle gave us a lesson on loyalty. It was noted that loyalty is characterized by faithfulness to ones' country, family, and friends but also by loyalty to God. Prior to heading back to Auburn, we checked out a couple of more geocaches that were hidden in the state park near our campground. One was easily found (especially since it was bright orange) but the second one really tested our geo-sense and our endurance. The cache was a two step find that involved solving a puzzle in the first container in order to find the coordinates of the second container. The puzzle was an imaginative arrangement that involved the use of red solo cups. Although we solved the puzzle, we unfortunately misread one of the numbers as a six instead of a nine. This sent us off in the wrong direction searching for the second container. We made a steep climb up a hill and off the other side without finding anything. We didn't have time to correct for our mistake and had to head home without a successful find. Maybe next time! At the PLC meeting on Monday evening, the youth leadership engaged in a campout critique. Everyone agreed that the adventure course rated the highest. The course challenged the boys in different ways and it showed everyone that they could go beyond their perceived limits. The PLC also praised the Birds of Prey show, the food, and the geocaching. A serious discussion was held about safety on future campouts and the ways we can avoid problems in the future. More photos are available in the online photo gallery. Some of them were taken by the scouts, which explains the unusual perspective of those photos.